With summer finally arriving in the UK, campsites booming and festivals underway, many of us will be packing up our tents and filling up our cars with all the essentials to get us through an outdoors adventure. However, one thing many will be without is electricity. Finding sufficient power at festivals and campsites can be troublesome. Some people prefer to go without any technology, opting for a digital detox. But many of us still rely on gadgets and gizmos to keep us connected to the outside world. We are taking a look at some of the top portable gadgets to keep you charged up and connected this summer! A tent is an essential item in any campers arsenal. 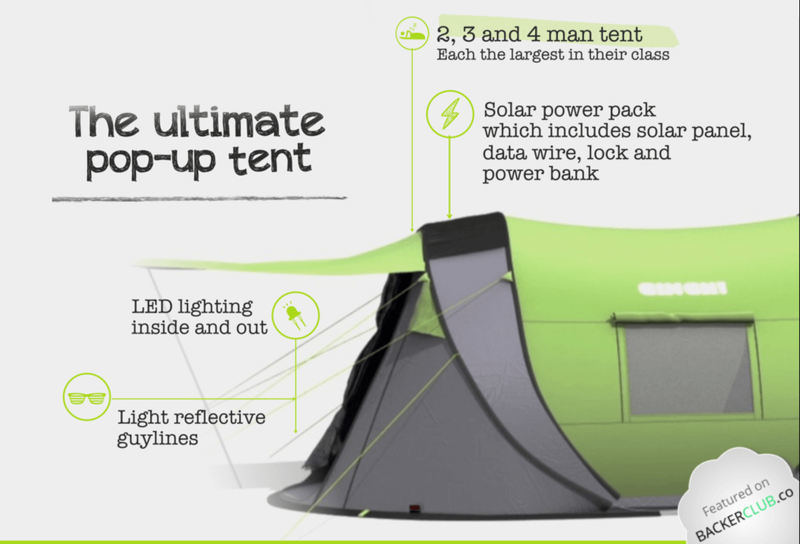 However one tent is taking advantage of the suns energy to create the ultimate camping experience. Popping up in seconds, the spacious Cinch tent has a solar power pack so you can charge anything from your phone, to your laptop, to speakers. It also includes light reflective guy ropes, LED lighting and LED tent pegs, to make sure you are never left in the dark. You can buy your pop up tent directly from Cinch, with prices starting at £149.99! Can’t find a plug socket at the festival? Your camp site doesn’t have power? Maybe it’s time for you to invest in a solar power charger. Simply leave it out in the sun or attach it to your backpack, it will collect the suns natural energy and turn it into electricity to keep your devices powered up. 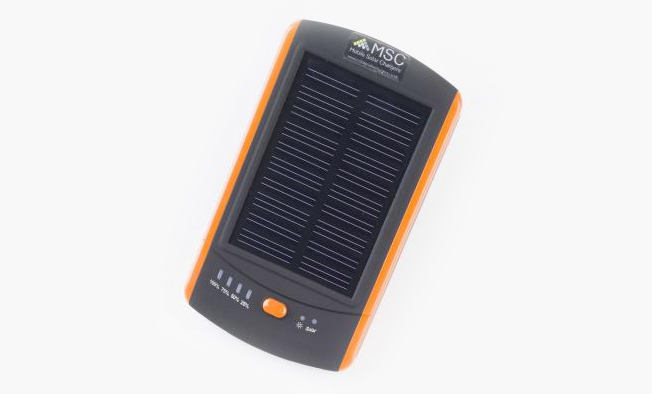 Rated Independents Best Buy, try out the MSC Travel Solar Charger! If you’re looking for a slightly larger solar powered charger and something to blast your music from, then Soulra may have a solution for you. 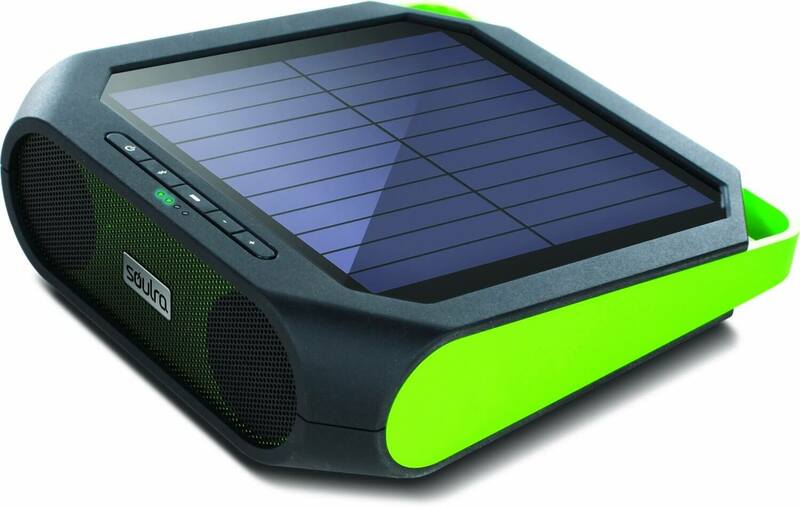 This solar powered battery pack is durable, waterproof and has a bluetooth wireless connection. The solar panel and battery pack allow you to get your phone to full charge in just 5 hours in direct sun, while playing music from the robust speakers. It also comes with a handy loop for you to attach it to your backpack, to charge as your explore. You can get your Soulra wireless solar speakers from Amazon! You never think it could happen to you, but then it does; you drop your phone in water, it sinks and breaks. But this floatable waterproof phone case means you no longer have to worry about your devices getting ruined and missing out on snapping a moment. Waterproof to 30 meters, you still have access to your touch screen and even comes with a built in waterproof audio jack. The clever invention means you have access to your phone wherever you are and whatever the conditions! Camping is all about travelling light and taking only what you need. This is not just a cooking stove, but also helps you stay warm and charges your phone at the same time. The stove uses an internal fan to create an airflow, which then combines with the fuel chamber to create a fire. The heat that is generated from the fire is then converted into electricity, which gets stored in a lithium-ion battery. 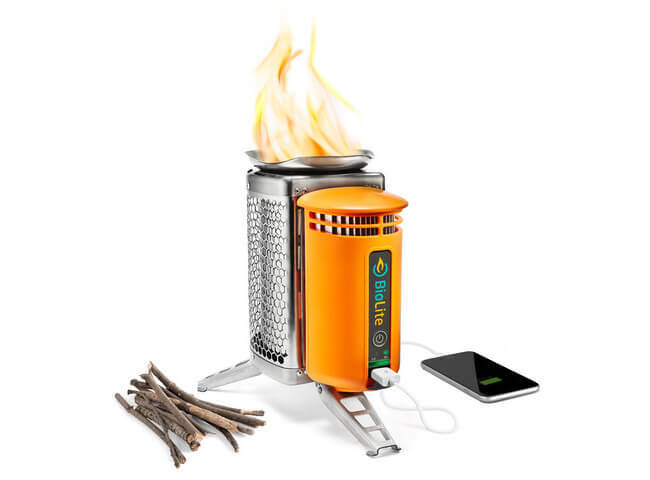 The camping gadget is extremely lightweight at just under 1kg, easy to carry around and is fueled by renewable biomass, such as wood, twigs, pine cones and various other flammable materials. 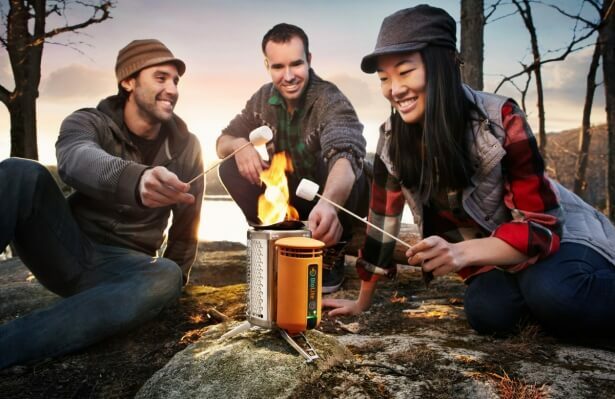 You can get your multi-purpose camping stove directly from Biolite! If you don’t want to be dependent on a sunny day and you want something you know you can rely on to charge your devices, then try the Veho Pebble XT. This battery pack has a capacity of 5000mAH, which equates to roughly 400% of an iPhones 3G’s battery life and is pocket size too. 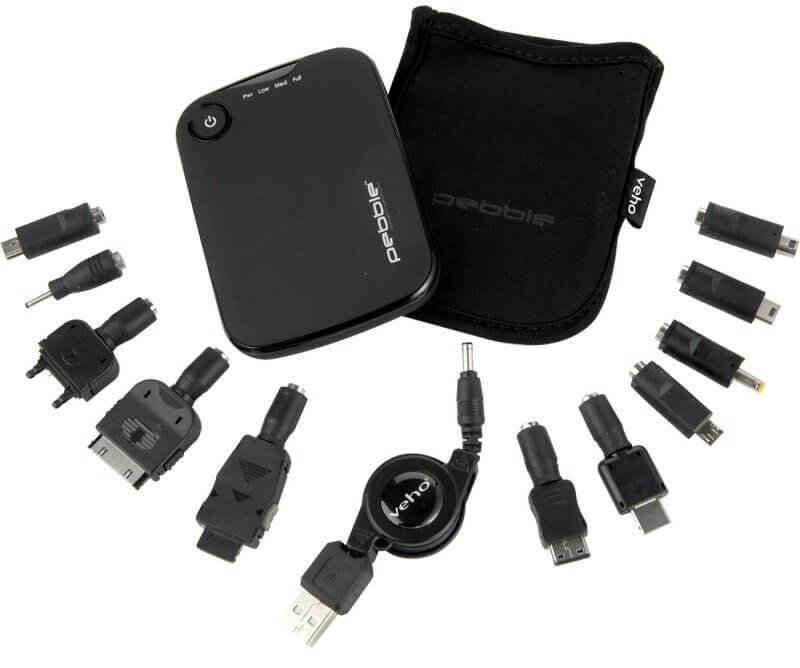 It takes just 6 hours to charge the battery pack, which can supply you with weeks worth of portable battery life. It comes with a wide variety of adapters, so you are sure to find one that fits your phone and other USB charged devices. Buy your portable battery pack from Veho! If you don’t want to lug around a speaker at a festival or around a campsite, we have found the perfect solution for you. 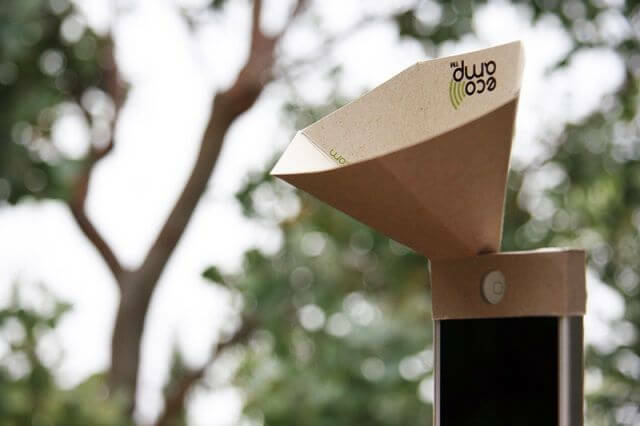 A start up company, Eco Made, has designed an environmentally friendly speaker amplifier, the Eco Amp, which is is constructed out of recycled paper. In an origami style fashion, you can quickly construct it yourself and reuse time and time again. It is lightweight and easy to take with you, wherever you go, whether it is camping, a festival or even a picnic in the park. They also have a version available for your iPad too! You can buy yours from Eco Made! Most of us will be aware of LED solar lights. However, this invention is catered to the campers and hikers of the world. With up to 16 hours of light in one single charge, the LuminAid PackLite solar light is lightweight, easy to store and waterproof up to a meter deep. It can float too, as well as hang on a tent. It includes a 32+ hour emergency flash setting and if you find yourself in trouble can recharge in just 7 hours of sun. Make sure you aren’t stuck without a light source and gets yours from Amazon today! While you’re away camping or at a festival, remember to keep your home secure. Try out these home security gadgets!